Understanding if one or more materials are the same or different is crucial to many industries. 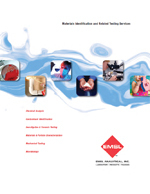 At EMSL Analytical, Inc., we determine if multiple materials are similar to each other or any provided reference. Our Materials Science staff use their expertise, references and applicable techniques to provide a comparison of the material(s) of interest. Comparative analysis is important in applications including alloy or metal working and fabrication, material selection, contamination, evaluation and certification, quality control, failure analysis, etc.